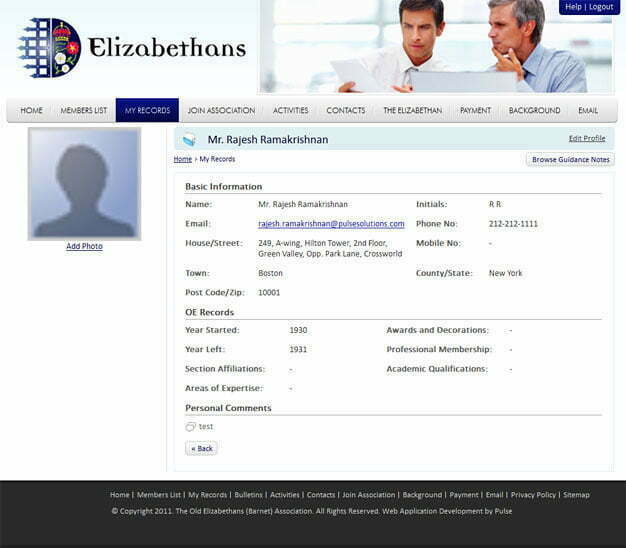 Old Elizabethans contracted Pulse to take their existing alumni web presence to a whole new level. The association needed a drastic improvement in terms of site security, accessibility, confirmation to latest web standards and full integration with social networks to make the website relevant to the new age audience. The Old Elizabethans Alumni Association is one of the most prestigious in the United Kingdom. It is a privilege to be working with them and the Pulse design team had a task of merging the historical branding with modern social networking techniques. It was critical to achieve a balance for acceptance by both the school elders and the new members just joining in. We created a design that not only confirmed to the requested standards but goes beyond by retaining all of the old features of the system and integrating them closely with Facebook and twitter. All the audiences can now access content seamlessly on the website, on their Facebook pages, on their Twitter and through their cell phones. The new website uses SSL 256 bit standards to encrypt all the data in transit and ensures suspicious activities by members is flagged and appropriate action taken before a compromise can occur. The login passwords have been tightened and new processes are in place to approve membership requests securely. The new Alumni website enables administrators to post content, update the site pages and contact members individually or in bulk through a powerful backend system that includes access control and tracking. All the data posted in to the website also gets streamed to the Associations Facebook and twitter pages automatically. Pulse Solutions excels at building custom business automation softwares that closely integrate with social networks. Click here to Contact us for your web application.